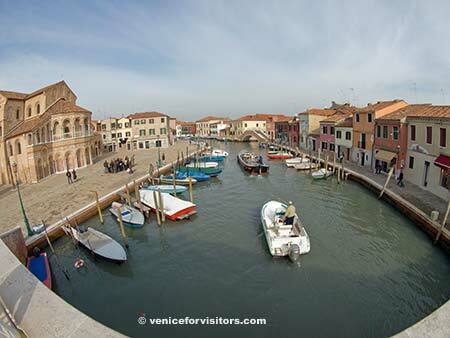 Like Venice, Murano has canals, ancient buildings, and historic churches such as the Basilica dei Santa Maria e Donato (shown at left in the photo). If you're at all serious about touring Murano or buying glass, pick up the Comprehensive Guide to the Island of Murano by Michela Scibilia and Nicolò Scibilia at any well-stocked Venice bookstore or souvenir shop. It's published by Vianello Photobooks, costs €19,90, and is available in several languages (including a first-rate English translation by Giles Watson). Also see our 10-page guide to Murano, the Glass Island, which has photos, tourist information, shopping advice, and links to other resources about Murano and Murano Glass.